Weiss collectors will immediately recognize the well-worn hat on the rocker—it’s the property of John’s elderly neighbor Grady, who’s been the subject of a series of portraits both informal and poignant. (Included are Old Friends and Forever Friends, both sold out at publisher.) 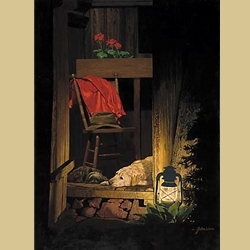 Framing the scene within a garden shed door and casting the warm glow of lantern light, John masterfully conveys a moment of comfort and peace. Published from the artist’s original oil painting. Available in both a print and giclée canvas edition.